Fall Colors. Available While Supplies Last! See the fall leaves before fall leaves! Color flows through Wisconsin from north to south, typically starting in mid-September and ending in October. Follow the march of color through the state and witness the green leaves transform to magical hues of deep red, golden yellow and blazing orange. Start planning your fall getaway today. Stunning fall drives just waiting to be explored. 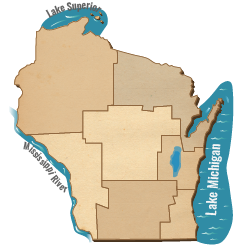 Follow the changing leaves and plan your trip with our interactive Wisconsin Fall Color Map. Local color reporters from every county in the state estimate the state's peak fall color in their area. Keep track of the fall colors and find the best ways to experience them when you sign up for our weekly Fall Color Report email. See the best locations for viewing fall colors. Experience fall color in Wisconsin from a vintage locomotive, chugging through our countryside! Get inspired and start planning your fall getaway. Read about our favorite hikes, fall drives, pumpkin patches, apple orchards, train trips, romantic getaways and more. Come join the celebration! Take in the colors on these northern fall drives. Road trip through southern Wisconsin's fall scenery. Grab your dirndls and lederhosen and bring the gang to join the celebration. Festivals are a way of life during the fall in Wisconsin. No matter where you go in the state, you’ll find a festival with plenty of room for travelers in search of fun. Gemütlichkeit, it's tricky to say but easy to feel when you visit Wisconsin in the fall. Friendship, warmth and good cheer. That's Gemütlichkeit and that's Wisconsin. You can't go wrong wherever you decide to go. View our travel guide to plan your next trip!